Take your push pin and poke 4 holes in the top of toilet paper roll tube. Shove a brown pipe cleaner through each hole. Pull it about half way through. 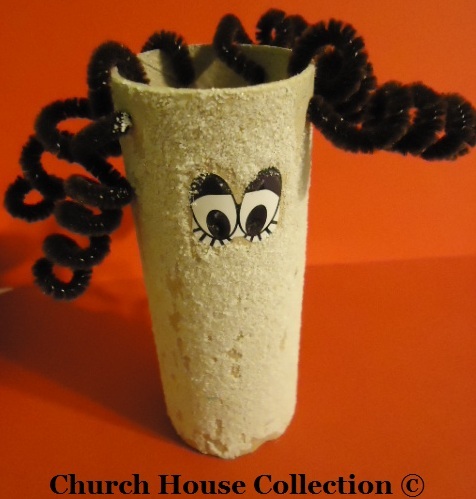 Take a pencil and wrap the pipe cleaner around the pencil to make curls and then slide the pencil out. Add your sticker eyes to the front. Take your stick glue and smear it all over the toilet paper roll tube and sprinkle salt all over it. This is Lot's wife that turned into a pillar of salt. If you don't have a toilet paper roll you could also use a popsicle stick and add yarn for hair and small goggle eyes and then smear glue all over the front and sprinkle salt on that.